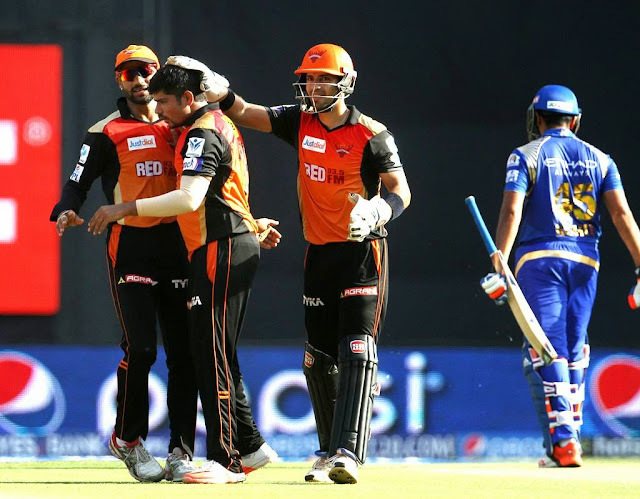 Sunrisers Hyderabad and Mumbai Indians engaged in what many deemed the "perfect match"—but it was a display of perfect bowling from one Lasith Malinga which would swing it in favour of the Indians. Mumbai who were keen to put on a good show in the tournament, came into the game with a target in mind and possibly a bit of homework. 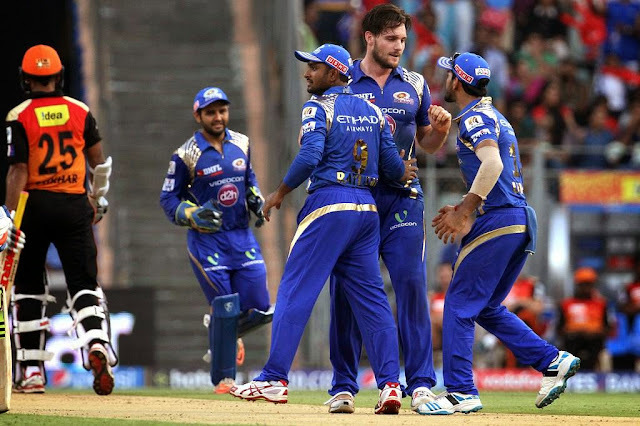 The Mumbai boys had an upperhand, playing the match at their own backyard. Also, 17,00 children came to see their team win the game. These children were a part of the total 70,000 children educated by the Mumbai Indians EFA (Education For All) initiative by Reliance Foundation. They surely enjoyed the treat as Mumbai Indians won it for them! Rohit Sharma got everything right on the day and the toss was no different. 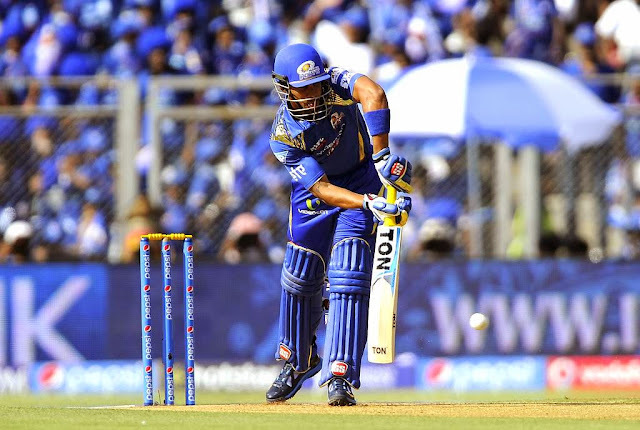 He won the toss and chose to bat first at the Wankhede Stadium. Desperate to get their campaign back on track, Mumbai Indians opener Lendl Simmons provided the impetus, showcasing a flurry of boundaries.But fell to Dale Steyn, the South African speedster immediately after getting to his 50. Steyn also removed his partner Parthiv patel. He scored 17 at run-a-ball. Young batsman and former India U-19 World Cup winning captain, Unmukt Chand came to the crease. He was chosen as the No.3 for Mumbai after some good performances in the previous games. However, we did not get one from him as he departed early with Praveen kumar, the India discard sent him back to the hut. Skipper Rohit Sharma and West-Indian all-rounder Kieron Pollard stitched on a good partnership to keep things going for their side. 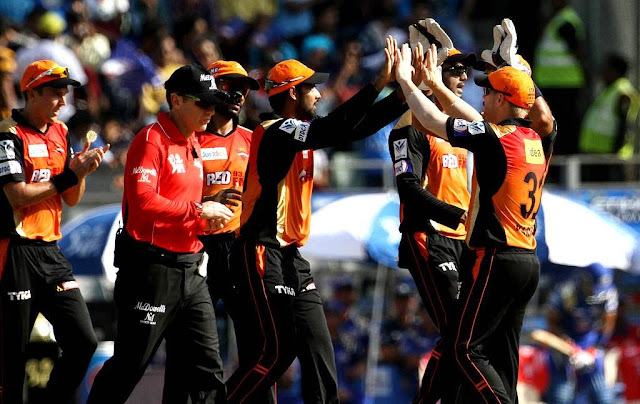 However, it was not for long that they stayed out there in the middle as the Sunrisers took control of the game after Mumbai posted 100 on the board. The leggie Karn Sharma, dismissed the skipper just when he was starting to look dangerous. Karn Sharma celebrates the wicket of Rohit Sharma. Except for Pollard 33(24) nobody contributed much. Bhuvaneshwar Kumar,the Indian pacer, was the pick of the bowlers. His figures read 4-0-26-3.Mumbai finished on 157/8 after 20 overs. Sunrisers knew that 157 was a par score here and fairly gettable target with the likes of Dhawan, Warner, Rahul, Bopara and Ojha in their ranks. Keeping this in mind, opener Shikhar Dhawan took charge of the proceedings as he quickly scored 42 off just 29 balls before falling to Kiwi quick, Mitchell Mclenaghan. While his partner David Warner failed to get going, departing early before scoring just 9 off 7 balls. Dhawan was off to a flyer. Looking it from a cricketing perspective, the rest of the batting never clicked as a unit. Only Lokesh Rahul 25(27) and the English all-rounder Ravi Bopara 23(27) could manage some runs. At the end of 20 overs, Sunrisers finished on 137/8 with the home-side winning by a margin of 20 runs. Man of the Match: Lasith Malinga was the Man of the Match for his brilliant figures of 4-1-23-4. Lasith Malinga rips apart Sunrisers Hyderabad.